Big Sis came home last week with a couple of Mother's Day goodies for me. I love it when the teachers let them do creative things that also make great keepsakes. This year, the kids filled out a questionnaire titled, "All About Mom." I was completely surprised by how much Big Sis really does know about me, and how much she pays attention around the house. I also got a kick out of some of the totally random things that she answered. Mom likes to say: "Clean my room!" 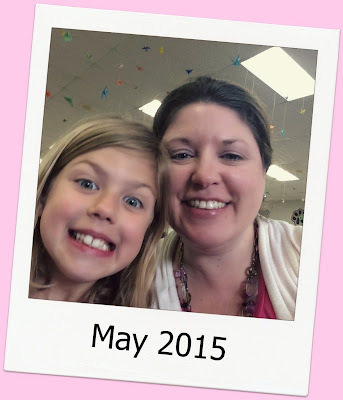 Here's our photo of Lunch with Moms today at her school. I love this kid. I just cannot believe she's going to be EIGHT next week!